Visit Phoenix Fashion Week’s Facebook page for up to date trends, articles and events! On Thursday, i CRAVE FASHION kicked off with a unique collection, Mary Jane Smokewear. Mary Jane Smokewear became a collection when partners JP Avila and Zack Maita had some free time to mess around with designs that were creative and could appeal to those fond of the product Mary Jane. 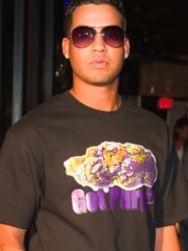 The line includes t-shirts for men and women sporting catchy slogans, like “got purple” and “I Amsterdam,” or booty shorts for women with the logo on the backside. Mary Jane Smokewear started selling at First Fridays, in downtown Phoenix. 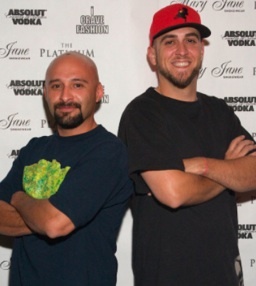 The heightened response from the art walk encouraged the designers to take it to the Cypress Hill Smokeout Festival. Mary Jane Smokewear blew out their sales, making over 100 sales in 2 days at the Festival. “We felt like we had a good head steam and expanded our designs and decided to go for it by devoting more time to it,” Maita said. Mary Jane Smokewear, founded in 2009, had their very first fashion show at the Crave Café and Lounge Thursday, April 15, and is planning on joining Phoenix Fashion Week at the end of September. Article written by Jacqueline Valle for Phoenix Fashion Week. Photos by Mikel Florman Photography. In January, 22 Lake Havasu High School students saw their dreams become reality during Havasu’s first ever fashion week. January 18-23, LHHS juniors and seniors unveiled their talents on the runway alongside designers from Phoenix Fashion Week, San Francisco and four boutiques on Havasu’s Main Street. When Brian Hill, Executive Director at Phoenix Fashion Week, found out about Havausu’s fashion week, he jumped right in. Phoenix Fashion Week teamed up with Deb Strother, LHHS’s fashion and merchandising teacher, to put on the event. 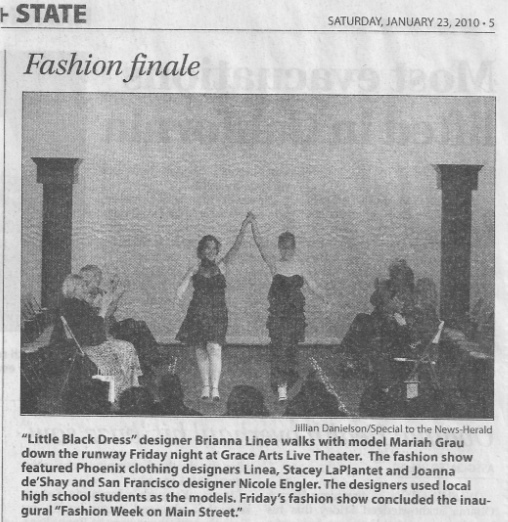 LHHS students strut down the runway at Grace Arts Live Theater wearing designs from Phoenix Fashion Week’s 2009 line-up, Black Russian Label, The Angry One, Bella Bijoux and Briana Linea. Briana added a word of advice to all aspiring fashion designers: always have a good attitude and work hard, and remember to ask questions and learn from other designers. Since Havasu fashion week, these fashion-loving students are one step closer to becoming established designers. Who knows, maybe someday we’ll see their designs on Phoenix Fashion Week’s runway. Article written by Chi-Lan Vuong for Phoenix Fashion Week. Welcome to Phoenix Fashion Week’s WordPress! Here you’ll find updates to the hottest trends and articles on our designers, buyers and sponsors. Look for Phoenix Fashion Week’s new YouTube Channel!